During December I love reading Christmas novels and novellas. Often I’ll start in November, and I also love watching Christmas movies. 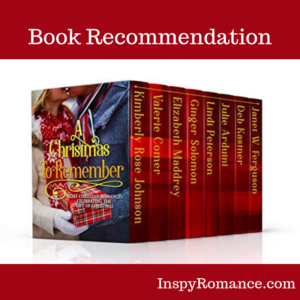 For Christmas 2018 I’d planned to read all the stories in ‘A Christmas to Remember’ that are written by our talented Inspy Romance authors. But… the best laid plans are often derailed, and weekly migraines during November messed with my reading schedule, big time. On the bright side, a new Kindle (early Christmas present) from the Black Friday sales has made it easier to read again. Today I’m going to share with you my thoughts on the novellas I have read. I decided to read this set in order, and started at the beginning with Kimberly’s story. Book Description: After a difficult breakup, Brandi Prescott is taking a hiatus from men and focusing on her career, the Lord, and getting to know herself. Everything is going according to plan until one fateful, rainy morning in Seattle when a passing car drenches her and everything changes. Narelle’s Thoughts: Until I Met You is a sweet story set in Seattle, one of my favorite US cities. The story opens with a cute first meet between Ian and Brandi. Ian’s a nice guy who feels really bad when he drives through a large puddle and accidentally soaks Brandi. He offers to buy Brandi a replacement latte at a nearby cafe, and the spark of attraction is ignited. Circumstances bring Ian and Brandi together and challenge Brandi’s commitment to the Lord to take a break from dating. I liked Brandi and admired her for keeping her ‘no dating’ commitment, despite being drawn to Ian in a more-than-friends way. During the story we’re introduced to Ray and Katie, friends of Ian and Brandi who have their own romance story in The Reluctant Groom (Brides of Seattle, Book 1). 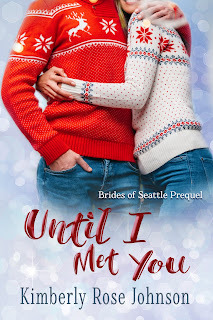 Until I Met You is a fun and lighthearted short romance to kick off the Christmas novella collection. Book Description: The Cowboy Santa program is supposed to be a chance to help his neighbors. When Kade Delgado’s ex-fiancée, now a single mom, shows up on his list, neither of them are thrilled. Is there any hope for a second chance at love? 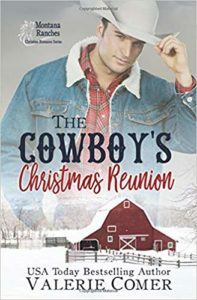 Narelle’s Thoughts: The Cowboy’s Christmas Reunion is set in small town Montana. I’ve enjoyed Valerie’s rural romance series and I’m excited to see her writing a cowboy series. Cheri made a poor decision six and a half years ago that led to a string of unintended and disastrous consequences. She has always regretted running away from Kade and disappearing from Saddle Springs a week before their wedding day. Kade has never gotten over how Cheri, the woman he’d loved, had left him. Years later Kade is working on the family ranch with his brothers, and he’s now a widower with an adorable two-year-old son, Jericho. Cheri is hiding secrets and her primary goal is to keep her sweet six-year-old daughter, Harmony, safe. Cheri’s return to Saddle Springs has Kade doing the math and coming up with an answer that’s not palatable. Cheri is only staying in Saddle Springs for a short time to help out her elderly grandparents who live on their rundown family ranch. A snowstorm unexpectedly throws Kade and Cheri together, and starts them on an emotional roller coaster journey to forgiveness and healing and restored love. This story has many layers and will pull at your heartstrings. I loved how the kids, Harmony and Jericho, bonded with each other. During the story we meet James and Lauren who will feature in the next book in the series, The Cowboy’s Mixed-Up Matchmaker (Montana Ranches Christian Romance, Book 2). If you’ve read Valerie’s Arcadia Valley books, you’ll know Cheri. She’s Alaina’s best friend and worked as Alaina’s assistant at Grace Greenhouse Children’s Center. The Cowboy’s Christmas Reunion is an emotion-charged reunion romance story with a strong faith and forgiveness theme. Another great addition to the novella collection. Book Description: When he arrived at the ranch, he wasn’t sure what he was looking for. She wasn’t looking for anything beyond stability for her son. 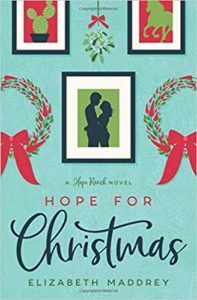 Christmas might be a season of hope, but do they dare risk everything for love? Narelle’s Thoughts: Hope for Christmas is set on a ranch in New Mexico. Maria is a single mom who works as a housekeeper on a ranch owned by Cyan’s grandparents. Her faith is strong and her life circumstances provide many challenges in the story. The story opens with Cyan at a beach on Whidbey Island, WA, with no real direction in his life and no idea of where he’d be driving later in the day. I have visited Whidbey Island, and totally understood why Cyan chose to park himself there and housesit a beach house. Cyan talks with his sister, Azure, who encourages him to visit their long lost grandparents in New Mexico for Thanksgiving. At the beginning of the story Cyan has an open heart regarding Christianity. He’s curious, has questions, and is seeking answers. The story has a strong spiritual thread and powerful gospel message without being preachy. I enjoyed this aspect of the story. Maria’s gorgeous son, Calvin, has a health issue that’s handled with care and sensitivity. I loved seeing Cyan and Calvin together, and the developing romance between Maria and Cyan is both charming and realistic. I understood why Maria was reluctant to put herself out there and take a risk on love. This is a story I’d recommend to readers who are exploring faith issues. If you’ve read Elizabeth’s Peacock Hill series, you’ll know Cyan’s sister, Azure, from A Heart Realigned. I’m looking forward to reading more stories in A Christmas to Remember. Have you read any or all the novellas in A Christmas to Remember? Do your read the box set stories in chronological order, or jump around and read them in a different order? I’d love to hear your thoughts. Hi Narelle, sorry to hear you’ve been suffering with migraines. Hopefully you have been able to rest. I read box sets in order the first time, then on re-reads, jump around. I also enjoy reading Christmas stories, so these were fun- especially connections to other stories! Merry Christmas from Bamberg, Germany! Maybe… We did have some snow earlier this year, http://bit.ly/2EvZENw, and my orchid on the window sill will soon blossom again, although this one is yellow. Hi Narelle! Thanks for sharing your thoughts on the boxed set A Christmas to Remember. I started reading Christmas stories in September. Usually I read boxed sets in chronological order, unless I received ARC copy from an author or the boxed set has more than 15 novellas and some do not grab my interest. Life is too short and my to read pile too long to read stories I am not interested in. As a mother of three sons and Oma to two grandsons, several who are computer geeks, my favorite story in the set was Deb Kastner’s The Cowgirl’s Christmas Gift. Cam had an unusual occupation. Add six year old nephews and I was hooked. Reminded me of my sons. Merry Christmas! I haven’t read any of the novellas in this collection but love the authors! If you haven’t picked it up, you’ll want to do it soon! The set disappears for good on December 30. Praying for you these days, that God will heal the barrage of migraines you’ve been dealing with. Migraines are the worst! I’m glad your new kindle helps. I hope and pray they stop altogether. I’ve have more than my fair share of debilitating migraines so I feel your pain. Hope you’ve got the migraines under control this month, or that they are leaving you alone. I’ve read A Christmas to Remember and loved it. One of my favorite collections. All the stories were wonderful and I did read them all in order. I too hope your migraines go away! What stands out for me from your post is migraine head aches! I wouldn’t wish them on my worst enemy! I hope that you find something that relieves the pain for you so you can enjoy the holidays!! Merry Christmas!! Thank you for sharing Narelle! Blessings to you and yours this Christmas season!